“Hammertoe” describes an often-painful deformity of the lesser toes. 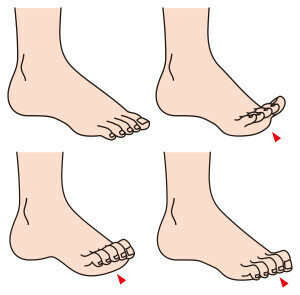 It is generally the bending downward of the middle joints in the second, third, fourth, or fifth toes. Most often, this starts out mild and progressively gets worse over time, unless caused by an acute injury. Unfortunately, a hammertoe will not go away left untreated and requires medical treatment from a qualified foot/ankle doctor. If left untreated, hammertoes can become rigid and will need surgical intervention to treat. Because of this, it is best to see a doctor as soon as you start to notice or experience symptoms. The Foot & Ankle Center at Orthopaedic Associates of St. Augustine has a staff of qualified orthopaedic and podiatric surgeons who are well versed in the diagnosing and treating of hammertoes. Hammertoe occurs when there is a muscle and tendon imbalance in the toe and surrounding structures. This imbalance comes from mechanical/structural change over time in to create the deformity in some people. Shoes with too-tight toe areas or high heels that may force the toes into the front of the shoe can also lead to hammertoe. Because of this, hammertoe pain is more commonly found in women, although men are not without the malady. If hammertoe is already present due to a muscle/tendon imbalance, ill-fitting shoes can irritate or speed the progression of it. Hammertoes caused by a trauma to the toes is less common, but equally painful. In the early stages of hammertoe, it may be easy to straighten the toe out. As hammertoe progresses, it will become increasingly rigid and more painful to straighten. Eventually, you will not be able to straighten it at all. Surgical intervention is often necessary to correct it, and more easily accomplished in the early stages. To diagnose hammertoe, the doctor will assess the visual state of the toe and will ask you about the symptoms you’ve been experiencing. An X-ray taken will verify the degree of curvature in your toe and show the bone and joint structure. If diagnosed early, there are a number of non-surgical treatments available to treat hammertoe. Footwear – You should avoid pointed toes, high heels above two inches, or shoes where the toe area is too tight. Padding for corns and calluses – The pads will protect the corns and calluses from irritation. These may be over-the-counter or prescribed. Splints or straps – Splints or straps can be applied by the doctor to help realign the bent toe. Orthotic devices – An orthotic device that is custom fit to your foot can help regulate the muscle and tendon imbalance associated with hammertoe. Medication – Oral nonsteroidal anti-inflammatory drugs (NSAIDs), like ibuprofen, might reduce inflammation and pain. Injection therapy – Corticosteroid injections may ease pain and inflammation, while Regenerative/ProLo therapy can reduce the weakness of the joint. If the hammertoe is rigid and painful, or open sores have developed, surgery is necessary. Depending on the condition of the toe, your foot surgeon may relax or move the tendons that caused the toe to bend. The surgeon may also need to correct the bone alignment, fuse the bones of the joint together or remove parts of the joint depending on the severity of the condition. If you are experiencing bending and pain in your toes and would like to speak with a doctor, you may request an appointment online to see us at our St. Augustine or St. Johns offices or call us at 904-825-0540.